CRAFTED WITH QUALITYBask in the warm glow of candlelight without the unwanted effects of paraffin wax. 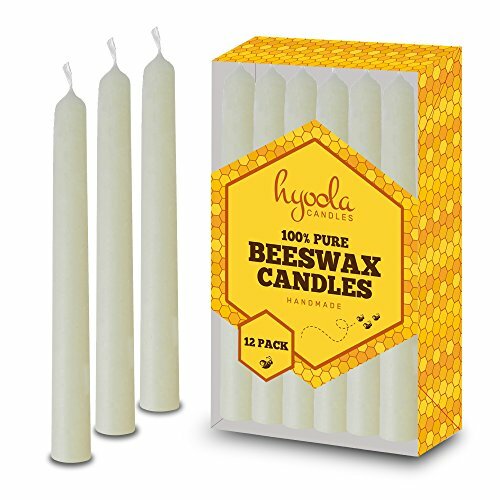 These 100% pure beeswax candles are handmade & individually hand-dipped. Braided cotton wicks easily catch the spark from your match and sustain a robust flame for a long-lasting burn. Our high quality beeswax melts evenly with minimal drip. A heating process lightens the amber-colored beeswax to an elegant ivory, perfect for use as Shabbat candles as well as other formal occasions.VERSATILE CANDLES FOR ANY OCCASIONBurning for approximately 4 hours, these beeswax candles have myriad uses:- Shabbos & Yom Tov Candles- Church, Vigils & other Religious Ceremonies - Chanuka Menorah- Weddings, Parties & Celebrations- Restaurants & Cafes- Yoga Studio or Spa- Emergency Candles during Power Outages BEESWAX IS BETTERThe material used to make candles matters for much more than aesthetic appeal.Our Beeswax Taper Candles allow you to:- Breathe easier: Keep your indoor air clean and relieve your lungs and sinuses with 100% pure beeswax candles free of the toxins in paraffin. Choose non-toxic to protect asthma sufferers and children.- Avoid pollution: Lead an eco-friendly lifestyle with beeswax, unlike paraffin that releases pollutants & contaminants into the air.- Minimize mess: Our premium beeswax melts evenly & slowly, dripping minimally without leaving behind the gunk & buildup of paraffin.Try Hyoola candles today and let us light up your life! HIGH QUALITY HANDMADE CANDLES: Homemade right here in the United States! They are made from premium natural beeswax and crafted to be reliable and useful in any household for beautiful decorating. lighting. LONG LASTING BURN: Keep the flame burning for up to 7 hours so they stay alit through evening get-togethers and lovely dinners - great strength make them highly dependable whenever you need them. TAPERED TO FIT IN MOST CANDLE HOLDERS: Great fit for most candle holders, the sophisticated tapered design will accentuate any living room décor fabulously so they elegantly fit any home with style. LARGE QUANTITY: Get 12 great candles in one order so you can keep any room in your home aglow for weeks, even months - get your money's worth with our candles that are greatly scented and last long. SIZE: approx 7.25 inch tall x 0.65"
If you have any questions about this product by Hyoola, contact us by completing and submitting the form below. If you are looking for a specif part number, please include it with your message.